Now that we’ve discussed how to make a good New Year’s Resolution, it’s time to talk about how to keep it. The Bubble Bath Method will keep you motivated all year long. It’s not the heat that causes popcorn to pop. Inside each kernel is a microscopic dot of water. As the kernel heats up, that tiny dot of water converts to steam. Steam pops the outer hull of the kernel to reveal the white fluffy stuff we enjoy at the movie theater. Water is powerful. It represents all of your enthusiasm, energy and interest. What’s a bubble bath without water? It’s you, stark naked, lounging in a cold, dry tub. That would be weird. If you want to keep your New Year’s Resolution this year, you’ve got to fire up the faucet. If your goal doesn’t get the waters of enthusiasm, energy, and interest running, don’t even bother to make a resolution. Failure is certain. Want to boost your water pressure? Start with ‘Why’. Why did you make that particular resolution? How will accomplishing your goal change your life? How will it improve your family’s life? Meditate on the reasons behind your New Year’s Resolution. It will keep you inspired when the waters get murky. You’re bursting with the waters of enthusiasm, energy and interest. That’s awesome. But our bath doesn’t have any bubbles. You can have all the enthusiasm in the world, but unless you add bath soap, you’ll see no bubbles. Bath soap represents time, money, education and any other resources necessary to reach your goal. Don’t you dare say that you don’t have resources. But I don’t have time to lose weight. Wake up a half hour early and go to sleep a half hour later for the next 90 days. You’ve just scored 90 hours that you can use to exercise, prepare healthy meals, and read a year’s worth of healthy living magazines. But I don’t have the money to launch my small business. I’d first like to challenge the idea that it takes a lot of money to start a business today. Chris Guillebeau’s “The $100 Startup” makes that abundantly clear. If your business idea does require significant capital, and if you’ve got lint in your pocket, why on earth would you make starting the business your New Year’s resolution? Your resolution should be, “This year I will research my business idea and educate myself on the industry.” For those of us with a laptop and Internet connection, education is practically free. Hop on Udemy, Coursera, or Youtube for low-cost, high-value training. Visit any one of the millions of blogs in your industry and download free ebooks. Call up a professional in the industry and ask them to let you shadow them for a few days. But whatever you do, don’t you dare say you have no resources. If you don’t pour soap in the tub, you’ll see no bubbles. If you don’t pour resources into your New Year’s resolution, you’ll see no progress. Don’t just sit there. Get in the tub. Let the bubbly waters envelope every inch of your body. Maybe not your head. You’d drown. That would be tragic. At this point you’ve poured everything you can into the bubble bath. Now you need others to come alongside you with support, encouragement and knowledge. Reach out to someone who has already achieved the New Year’s Resolution that you’re aiming for. Join a community of people who are on a similar journey. Want to earn an income doing work you love? Check out the 48days.net community. Is this the year you finally make a living as a writer? 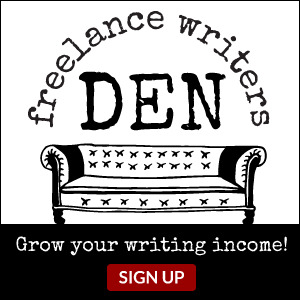 See what they’re up to in the Freelance Writer’s Den. Step three is about going deep. Whether your New Year’s resolution is to lose weight, earn more or improve your attitude, there is a community of people out there who can help. Your job is to find them and let them keep you accountable. Bonus tip: Even the best bubble bath can fall victim to a greasy hairball or dead fly. Sometimes you have to open the drain to let out the gross stuff–negative thoughts, negative people and negative environments. Pour in some bath soap–money, time, training, etc. Disclaimer: The post above contains affiliate links to products that I think are the bee’s knees. Please see my disclosure policy for more details. I like that analogy. Simple and easy to remember. Thank you for stopping in Adrian. I enjoyed your post on why you love blogging. Very inspirational. Great analogy, very visual, very thorough. Is stealing your disclaimer illegal? Thank you for stopping in Kris. Steal away. Tee hee hee.